Note: Actual printed cards on an actual table. Card dimensions approximately 5" x 2.5". Photographed by a friend. The backside of the cards, those are pretty as well. can you release them? No. There are only 13 decks in existence paid for by myself and given as gifts to friends and one other (who may have already misplaced it, I don't know, she must get lots of random gifts). Not releasing the back art keeps them from being sold by someone else, and if even one deck gets sold then I'm on the hook because of Hasbro's C&D. darn. Welp, than I have to design a backside myself. 'cause i love these cards and i want to print them! Sweet! Are these for sale (or going to be)? If the answer is "not yet", I second the suggestion to create an Indiegogo or Kickstarter campaign; I'd totally back that! barring a C&D from Hasbro, an Indiegogo campaign should be ready to roll in less than a week. the promo video has been shot and is in the process of being edited, the section blurbs are written, and the example backer rewards are finished. this is happening so stay tuned. Wonderful! I assume you're gonna post a journal once it's ready? I should watch you so I won't miss it. yep. on my journal. just waiting on the final edits to my video promo and it will go live. hoping it'll happen some time this weekend. OMG THESE ARE AMAZING! You can guarantee I'll be one of the first to purchase this deck once it's available. Just the other day, I was wishing I could art, because I really wanted to draw up a pony Tarot, and Tarot just isn't something you can comission. I love you for doing this! Oh my goodness. I need these for my gypsy Pinkie Pie cosplay. I was missing something and THIS is it! gypsy Pinkie cosplay! that's spectacular. I shared this on my FB page, I hope you don't mind! no i don't mind. thank you for the share. when i know the answer to that, i will let everyone know. that's right around the price point i want to make it, but it's kind of a specialized thing. i'll have to shop around for a reasonable printing house. if you dont mind, could you send a link when you are ready to sell? I'm in on this. Keep updates... updating. that's very kind of you! i'll see how much the initial print run will be (subsequent runs, i've heard, should be substantially less), and if i cannot afford it out-of-pocket, then i'll start making plans for crowdsourcing. as am i. need to get a job first, and then come the well-laid plans. an excellent and foolproof plan. Still want. I'll have to keep an eye on your progress with an eye to purchasing a set in the future. I've been interested in the concept of Tarot for quite some time and how it's been used. haha. i've always been interested in the Tarot too, but i could never UNDERSTAND it. i realized that this was because all the symbols of the old, established Tarot decks was totally inaccessible by modern standards (and many new Tarot decks all had pale, tragic women with dragons and fairies because Emo Goth Wiccan). and then i fell headfirst into MLP and found myself mired in a totally consistent, incredibly designed visual world populated by a broad and deep range of characters (that share the same archetypes and mythic undertones as the Tarot), and i thought I CAN DO SOMETHING WITH THIS. That was going to be my other question: How ponies and the Tarot were mixed up with the each other besides the usual rule that 'everything must be ponified'. That there answered it quite nicely. i personally believe that any "universe" with enough depth and breadth can be turned into a functional Major Tarot. a friend of mine did it with Arrested Development. 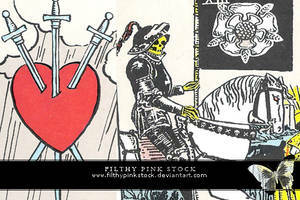 I'm not into tarot cards or anything but even I would buy these. The art is already gorgeous and having them on cards is very nice. So I don't want this. I NEED THIS! that's really encouraging. thanks. when the deck is finished i'll see what i can do.